First up, Chanel Vitalumiere Aqua is the newest of the bunch, and has become my go to for days where i want a light-medium, natural coverage. On my skin its not all that dewy, more satin/skin like, which makes it perfect for days where i don't want my skin to be the main attention, and also helps me to forego powder. Definitely a great one for the summer! My other daily base of choice is my much loved Nars Pure Radiant tinted moisturiser. This has a pretty good coverage, medium i'd say, and leaves a gorgeous healthy glow to the skin. I would say this one is better coverage wise than the Chanel, but you can feel it that little bit more, although they're both pretty undetectable. This ones great for my dull skin days, or days where i'm feeling lazy with the SPF as it has SPF 30 to boot. 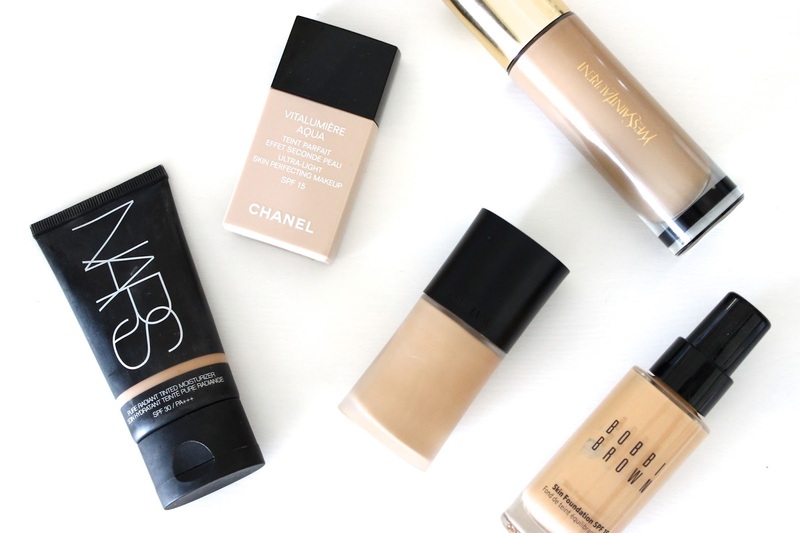 Foundation wise, theres only really three i reach for. The first being another lighter base, but this one more buildable. The Bobbi Brown Skin Foundation is probably my favourite foundation for the daytime when i want something more 'foundation-like' rather than tinted moisturiser. It starts off as a light-medium coverage, but can be built up to a medium so that you only really need to conceal blemishes. It does a great job at counteracting redness and minimising dark circles, which i LOVE as it means i don't have to pile on the corrector. it lasts a pretty good time on the skin, although i do make sure to powder afterwards to make sure it lasts. For the evenings or occasions where i want my skin to look extra lovely, the Giorgio Armani Luminous Silk foundation gets brought out. The fact it has no SPF means i rarely wear it in the daytime unless i'm filming or going out somewhere nice, but this is the only thing i wear come evening. Its a medium coverage with a skin like finish, but can be built up to be more full meaning its a great all round foundation. I always tend to pair this with a radiance primer to give me a bit more of a glow, but even on its own sans primer its lasts pretty darn well on the skin! Go try it, Go! Lastly, the all rounder. I couldn't not mention the Yves Saint Laurent Teint Touché éclat could i? This foundation has been my favourite for a while now, but i couldn't quite decide where to put it in this post. This tends to be my failsafe foundation, for if i want my skin to look perfect, but also not feel heavy and made up. This is a great one for day or night, so i know if i put this on i'll be happy with my makeup whatever crops up. Its a good medium coverage but just seems to even out my skin so well, leaving me with a healthy natural glow. It stays put all day too, which is great! Theres a few new foundations on my radar at the moment, so we'll see if anything else ends up getting added to the stash...Let me know your favourites in the comments!